Choosing from the Best Trumpet: Which One is on Top? Acoustic electric guitars are the preferred option among recording musicians, as well as those who do occasional gigs. If you are not familiar with this instrument, an acoustic electric guitar is one which is designed with a pick-up and a pre-amp. All you need to do is to plug your very own acoustic electric guitar to your amp and you can now expect a bigger audience to hear your sound clearly. It is often a good thing to have several options that you can choose from. However, the same thing can also prove to be daunting, because now, you have to make the best decision you would ever need. The good news is that, I have created this review in order to assist you in making the best decision in this regard. In the next parts of this guide, you will come face-to-face with acoustic electric guitar reviews, where you will learn about the features, advantages and disadvantages of the best electric acoustic guitars currently available on the market these days. You will also learn how to choose the best acoustic electric guitar that will fit your needs and preferences. Even before reading the other factors below, it is very important to consider things that you have control over. How much are you willing to spend for an acoustic electric guitar? What is your purpose of use? Is it for a regular, professional gig or occasional leisurely use? Your answers to these questions will determine the kind of acoustic electric guitar that you can get for yourself. When it comes to purpose, you need to determine right on whether you will play together with a band, or bring your guitar with you to public events. These guitars are equipped with some pickups and preamp, thus enabling them to be plugged to a sound system or amplifier without unnecessarily distorting their rich sound, without limiting mobility while playing. If you are relatively new to this type of instrument, you may want to avoid spending a hefty amount of money for a high-end option yet. There are a lot of available options on low to mid-range, good quality acoustic guitars that you can choose from. On the other hand, if you are a seasoned player who is just searching for an option for upgrade, you may want to learn more about the differences among the different types of tonewoods, as well as the way in which soundboard impacts resonance. Keep in mind that that top of the acoustic electric guitar has the biggest impact when it comes to the quality of the tone of your music. The sound that is created by the strings is transmitted via the bridge going to the top, which is where it is being amplified. Acoustic tops are usually made of either solid or laminate wood. A top that is solid is generally made of two single-ply pieces of wood with grains that are matched to the guitar top middle. On the other hand, a laminated top is made using a number of wood layers, pressed altogether. Keep in mind, however, that laminate top may not vibrate as good as compared to solid wood. Therefore, the sound that it produces is not as rich or great compared to solid wood tops. Still, they are a great option for beginners, as they are more affordable. Last but not the least, you also have to take into consideration your personal preference. Never underestimate the role that preferences play in choosing an acoustic electric guitar. Select one that feels extremely comfortable in your hands, whether you are standing or sitting. Choose a guitar that will respond appropriately to the way you play. Avoid settling on a guitar that is just ‘enough’, especially if you doubt the way that it sounds to your ears. With this, it is highly recommended to come prepared with some defined expectations, perhaps a list of features that you would like to see in your acoustic electric guitar. With a basic understanding of the way acoustic guitars work, as well as the materials that are typically used in the construction of these guitars, you will be able to select one that will fit your preferences, style and needs. As a full measurement guitar, the Blue Full Size Thin line Acoustic Electric Guitar measures 41 inches, with a three inches thickness in frame that emphasizes its thin line characteristics. It comes with a frame is made out of rosewood. The guitar’s center piece are brass strings which are used in producing quality sound. At the same time, its blue color offers character to its appearance, combined with a certain level of elegance. While this product may face some challenges when it comes to its built-in features, it is still considerable as among the most productive and performing option under its category, and within its price range. As such, it is a good beginners’ guitar. What I personally like about this guitar is that with its three inch thickness for the frame, it is relatively smaller compared to other guitar models. This means that it is ideal even for beginners, as well as young players. The ‘thinness’ of the guitar makes it easier to wrap their hands around it, and learn while playing. When it comes to quality, Yamaha is one brand that always stands out of the list. This time, their APXT2 3/4-Size Acoustic-Electric Guitar is an amazing travel-sized guitar that is available in a really nice price. The body of this guitar is a resemblance of its sibling APX500. Its mini-Venetian cutaway is amazingly cool, with a shape that highlights the space situated up on top, in a way that is sort of compensating. The APXT2 3/4-Size Acoustic-Electric Guitar also comes with plenty of volume, considering that it is a thin and small guitar. Other features also a pre-amp, on-board tuner and pickup. For an affordable price, it is a great choice for beginners. The moment this guitar is plugged into an amp, the music that is created can rival other guitars that are relatively more expensive. This is because Yamaha has implemented the ART-based pickup system in this guitar, thus producing quality within its price range. If you are looking for a great travel companion for an affordable price, I can highly recommend the APXT2 3/4-Size Acoustic-Electric Guitar from Yamaha. Appearance wise, it also looks cool and elegant. This Hellcat acoustic guitar is based on the vintage 60’s gitbox of Tim Armstrong. As such, it features a combination of punk tones, together with some acoustic elements, which is a perfect match. The body of this guitar highlights a solid mahogany top, together with a 4-ply tortoise shell pickguard. Both of the sides and back are also made using laminated mahogany, together with a gorgeous satin finish. The electronics of this acoustic electric guitar is also interesting, as it runs a Fishman Isys III system that comes with a tuner and an active onboard preamp. As such, it comes with several controls which can refine sound even better. Personally, what makes the Fender Tim Armstrong Hellcat Acoustic-Electric Guitar an attractive option is the sound that it produces. Despite being a small sized gitbox, it is highly capable of projecting bright and stunningly rich tones. The sound delivered is quite distinctive, given the size. The Epiphone EJ-200SCE Solid Top Cutaway Acoustic /Electric Guitar is a classic jumbo styled guitar that comes equipped with stunning electronics. It is also relatively cheaper, which means that it can easily beat other competitors that are more expensive in this category. This guitar comes equipped with a solid spruce top and a select use of maple on both the back and sides. Its rosewood bridge is also equipped with a synthetic bone saddle, while its rosewood fingerboard comes with 19 frets, with some very attractive crown inlays. The hardware of this guitar is purely of class. Its gorgeously looking headstock also features a gold grover tuning peg. With the use of the eSonic Pre Amp2 system, this guitar offers a huge edge against its competition. 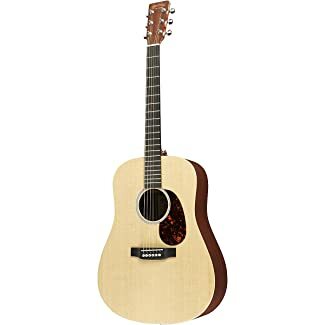 I would highly recommend this acoustic guitar for those who are searching for a high-quality, reliable acoustic electric guitar that is within the affordable category. It is perfect for use while chilling at the beach, in a country club, or any place where music is appreciated. The Martin DX1AE Acoustic Electric Guitar is included in the Martin X series guitars. 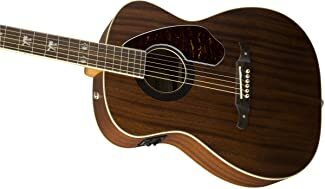 It is a dreadnought shaped guitar which means that it is equipped with an amazing driving sound and good volume. A part of the guitar is made of solid wood top. Being the most important part, constructed using solid wood is a huge plus. It also uses a Sitka Spruce which has been considered as the standard among acoustic guitar tops, thus doing an amazing job, serving as an all-around top, giving clarity to a wider tonal range and well expressed dynamics. Both back and sides of this guitar are made using high pressure laminate Indian rosewood. This use of laminate wood does not impact the tone of music produced negatively. The neck is also made using Stratabond instead of mahogany. The material is made of laminate wood. The nut of this acoustic electric guitar is made of a man-made synthesized material called Corian. The saddle, on the other hand, is made of TUSQ, another synthesized material that is commonly used for nuts and saddles of guitars. It works in emulating bone with more consistency. What I really feel surprising about this guitar is that one of the first things I noticed right away is not how light the neck is, but how strong it feels. For this, it has the capacity to resist warping. While you have the choice to select either an acoustic guitar, or an electric one, with an acoustic electric guitar, you can enjoy the best of both worlds. With the different options that are currently available on the market these days, coming from different manufacturers, choosing the best acoustic electric guitar can seem to be a daunting task. However, with the guide presented above, along with some of the best acoustic electric guitar reviews, you are now equipped with the knowledge that you need in order to make the best decision. As highlighted earlier, your personal preferences should never be left out of the picture. As such, it is highly recommended to come prepared with features that you want to see, and compare them with the options that are presented above. By doing so, you can make a well-informed decision in the end. What Is The Best Hollow Body Guitar ? musicinstrumentscenter.com is a participant in the Amazon Services LLC Associates Program, an affiliate advertising program designed to provide a means for sites to earn advertising fees by advertising and linking to Amazon.com. Additionally, musicinstrumentscenter.com participates in various other affiliate programs, and we sometimes get a commission through purchases made through our links. © MIC Corporation, Inc. 2017. All rights reserved.